Record rain means more baby parrots. SAN DIEGO (KGTV) - Residents in many San Diego neighborhoods get a daily reminder of the odd inhabitants that are not native to the area. As the sun rises over the region, the squawks can be heard. The wild parrots are awake. While the sight of emerald, red-headed birds has long been gold for local photographers, what has remained a mystery to many is how they arrived in San Diego. 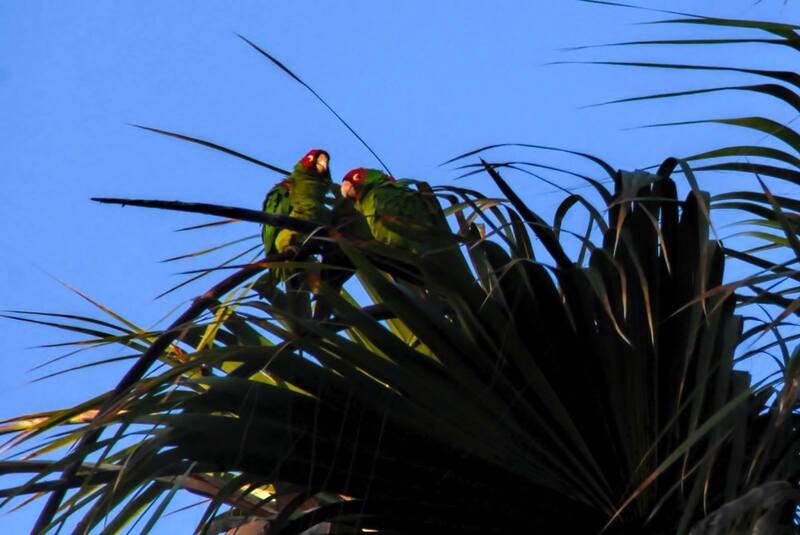 All of the wild parrots in San Diego are birds or descendants of birds brought to the area by people, according to Sarah Mansfield with SoCal Parrot, though some have speculated they migrated from Mexico. Mansfield added the birds weren't released in the area just once. "Whether they were released intentionally or accidentally, several 'micro-releases' happened over many years," Mansfield said. "There are five established species of wild parrots in San Diego, and 13 species in Southern California, so it definitely wasn't just a pair or two that got out long ago." It wasn't illegal to buy wild-caught parrots until 1992, when the Wild Bird Conservation Act was signed into law in order to ensure exotic bird species were not harmed by international trade. "The birds that were released came from the wild and have remained wild since," she adds. University of San Diego professor Janel Ortiz, who started the San Diego Parrot Project to research the parrots' eating habits and natural behaviors, says parrots may have been here longer than we think. 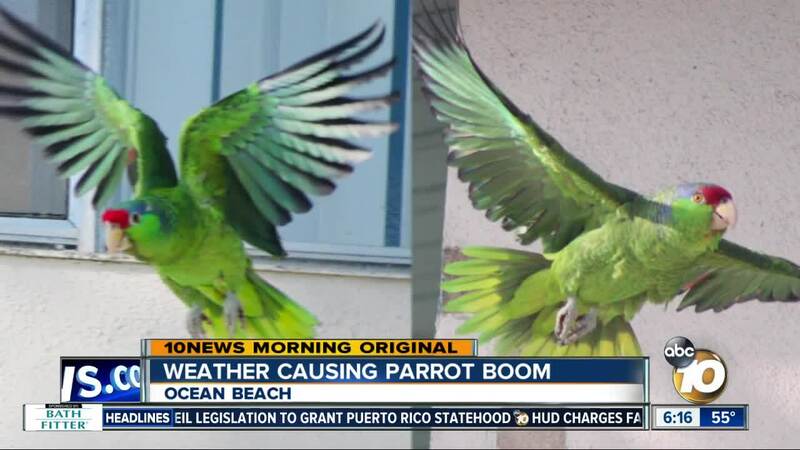 "No parrots are native to California; there has been evidence of the parrots being here in the 1940s and weren't well documented until the 1960s," Ortiz says. Currently, Mansfield says the main species in San Diego are Mitred Conures, Red-masked Conures, Blue-crowned Conures, Red-crowned Amazons, and Lilac-crowned Amazons. The Mitreds and Red-masked Conures can commonly be seen flocking together, while both Amazons species also live together. Residents may also notice both Consures and Amazons together in the same neighborhood at times, but usually they're not together, Mansfield says. So how does a bird not native to San Diego find a way to survive? Find another non-native species. The parrots live off non-native fruiting and flowering trees, according to Mansfield. Ornamental trees, including magnolias, loquats, pines, eucalyptus, coral trees, and pecans, give parrots food and shelter all in one. "They nest in cavities in the tall palms that line our beach community streets," Mansfield adds, something residents who aren't a fan of the birds' squawks know all too well. San Diego's climate makes their habitats all the more comfortable, as the warmth provides the perfect environment for the parrots. "While they could make a go of surviving in colder weather, they do better with our sunny San Diego temperatures," Mansfield said. Ortiz says San Diego may be one of the last locations where these endangered parrots can survive. "Most of these parrots are endangered in their native ranges, but are thriving here in this new, urban habitat we've created," Ortiz said. 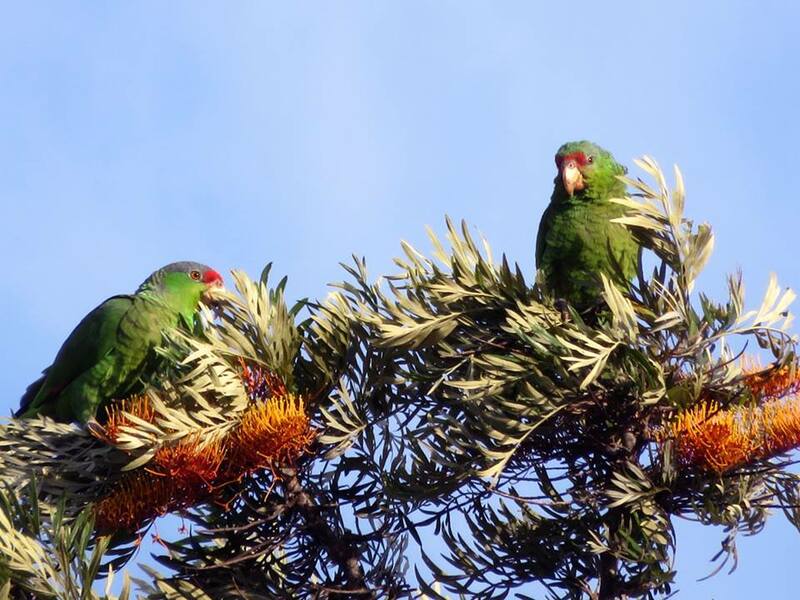 "Urban places, like San Diego, may be one of the last locations these endangered parrots may be found if their populations continue to dwindle in their native ranges." While the birds are naturalized, meaning they are actively breeding in the area, it's unclear how successful they are at reproducing, Ortiz says. So far, the Parrot Project has observed some species-specific differences such as time to roost, or time they get together at night. 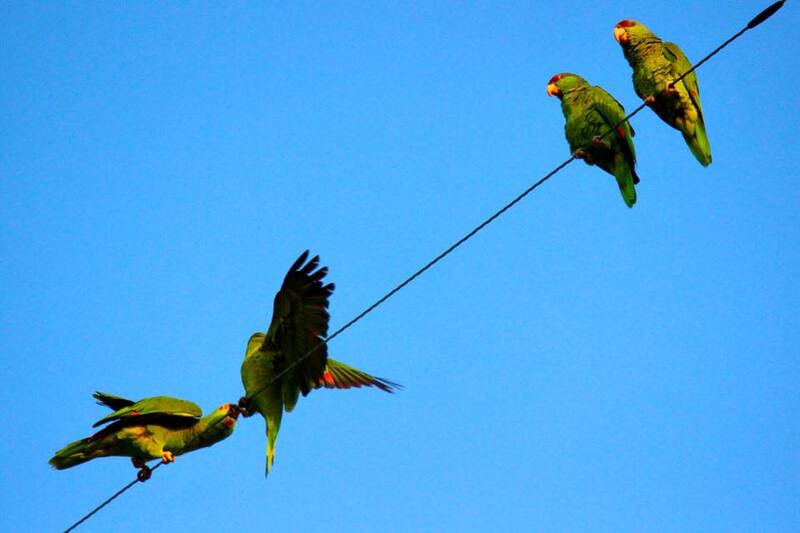 Residents can help out by filing out a form online to document parrot sightings.